According to a recent survey done by comScore, customer service has a great deal to do with cart abandonment, specifically delivery of their purchased goods. 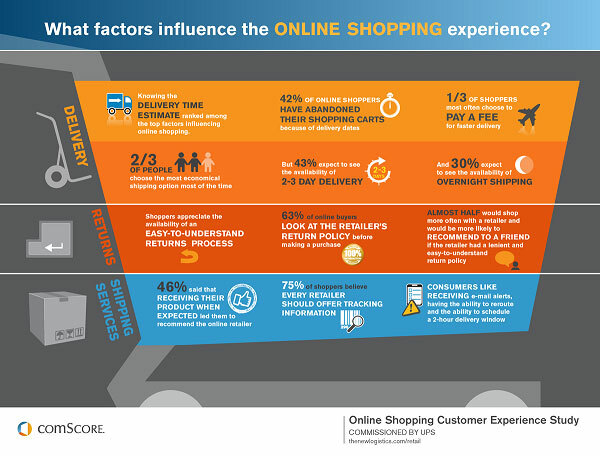 Knowing what the delivery time will be ranked among the top influencer of online shoppers. In fact, 42% of online shoppers abandoned their carts because of delivery dates. Almost the same percent, 43%, expected to see a 2-3 day delivery period and 30% expected overnight delivery to be an option. Correspondingly 1/3 of shoppers chose to pay additional fees for faster delivery while the balancing 2/3 chose the cheapest rate possible. 75% of those surveyed thought that every retailer should not only offer tracking information, but also appreciated receiving email alerts. This is an important marketing consideration since 46% said that receiving their product when they expected it caused them to recommend the retailer to a friend or family member. Another service that influenced shoppers to recommend an online store was a retailer’s return policy. More than half of those surveyed said they read a retailer’s return policy before buying and that a lenient and easy-to-understand return policy (see Zappos and Gilt) led them to recommend the retailer to friends.